Virginia State University is a four-year, state-supported, coed university. Founded in 1882 as the V…. Virginia State University is a four-year, state-supported, coed university. Founded in 1882 as the Virginia Normal and Collegiate Institute, the school did not open its doors until 1883 because of a hostile lawsuit. The school awarded its first bachelor’s degrees in 1889. In 1902, the name changed to Virginia Normal and Industrial Institute. That same year, the legislature revised the charter act to curtail the collegiate program. Land-grant status was moved from Hampton Institute to Virginia State in 1920. Three years later, the college program was restored, and in 1930, the name changed to Virginia State College for Negroes. In 1944, the two-year Norfolk branch was added to the college, and in 1956, the Norfolk branch became a four-year college. The school gained its independence as Norfolk State College in 1969. 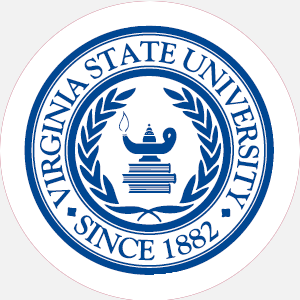 The parent school was renamed Virginia State College in 1946 and adopted its present name, Virginia State University, in 1979. From its humble beginnings of 126 students, 7 faculty members, and one building located on 33 acres, Virginia State has grown to 236 acres with more than fifty buildings, fifteen dorms, sixteen classroom buildings, and a 416-acre farm. As one of the state’s two land-grant institutions, Virginia State is dedicated to providing an education that challenges intellect and prepares students to become knowledgeable, perceptive citizens who are secure in their self-awareness. This small institution offers big opportunities, so students’ possibilities are limited only by their willingness to commit to the task. The University is accredited by the Southern Association of Colleges and Schools to award the Bachelor of Arts, Bachelor of Science, and master’s degrees. Percentage of students receiving financial aid: 92 Total amount of scholarships and grants: ,594,925 Financial Aid Specific to the School Army ROTC offers two- and three-year scholarships that pay tuition, fees, books, and a monthly stipend. Students should contact the ROTC Office on campus. May l (fall); October 1 (spring). Students must submit an official high school transcript with 15 units, including 4 English, 2 mathematics (including algebra), 2 science (at least 1 unit with lab of biology, chemistry, or physics), 2 social studies (1 unit in U.S. history), 2 foreign language, and 3 electives. Students must have proof of a physical and two letters of recommendation from a high school counselor and teacher. A nonrefundable application fee of is required. A minimum of 120 hours, including the core requirements of 6 hours of mathematics, 3 hours of science, and 3 hours of computer science with at least a 2.0 GPA. Student must earn the last 30 hours at Virginia State and must participate in the graduation ceremony or submit written notification of absence. Total enrollment: 4,303 In-state: 3,062 Full-time undergraduates: 3,147 Part-time undergraduates: 352 Graduate students: 804 Ethnic/racial makeup: African American, 3,919; Asian, 15; Caucasian, 292; Hispanic, 39; Native American, 4; Other/Unclassified, 34. Campus Regulations: Registered car permitted. Campus Services: Health clinic, personal and psychological counseling, remedial services, career counseling and placement, and religious services. Campus Activities: Student activities include drama or theater groups, band, chorale, and orchestra, as well as a lecture series. Students can get involved in the student-run newspaper and radio station. Leadership opportunities can be found in the Student Government Association or other student-run organizations. Greek fraternities include Alpha Phi Alpha, Kappa Alpha Psi, Omega Psi Phi, and Phi Beta Sigma; sororities include Alpha Kappa Alpha, Delta Sigma Theta, Sigma Gamma Rho, and Zeta Phi Beta. Local fraternities and sororities are also represented. Sigma Xi honor society is also present on campus. Housing Availability: 2,082 housing spaces available, freshmen given priority. Handicapped Services: Wheelchair accessibility and services for the visually and hearing impaired.